9-10 cups a day too much food for a 5 month old GSD? I have a 5 month old GSD pup who was recently neutered, and when I took him back for his check up a couple of weeks afterwards the vet questioned me on how much I was feeding him because she said he was looking thin. I feed him 6 cups a day of blue buffalo brand large breed puppy food over three feeding times which is a full 1.5 to 2 cups more than the bag recommends for his age. The vet said I should bump it up to 9 cups immediately then after a few days go up another half cup every feeding time and watch to see how much of it he eats and go from there. When he went in that day he weighed about 45 lbs. I admit I have questioned myself about his weight (you can faintly see his muscular structure of his ribs) and even asked my trainer if he looked thin and if I should feed him more, but she seemed to think that 6 cups was a lot. Wooooooowwwwwww! That's a lot of food - and for only one puppy?! Yes, I would have to say that that's waaaaayyy tooooo much! And I would have to disagree with your vet on this. Please check the dog food bags feeding suggestions for something to go on as far as weight and age goes - and keep in mind that this is only a suggestion but it kind of gives you an idea of where to start. Then I would suggest you back off what you're feeding now - slowly, over the course of a couple of weeks - until you're somewhat closer to that amount. Now not all puppies require the same amount of food - some may need more, some less, and how active your GSD is, it's age, overall health and so much more affect the amount of food needed too. 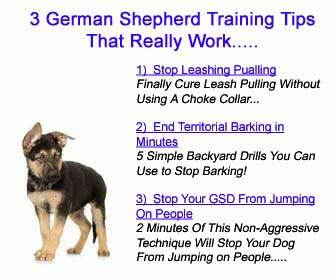 But it's better to keep a maturing German Shepherd puppy a little thin than too heavy any day - especially on all those developing joints and bones. Good luck! Comments for 9-10 cups a day too much food for a 5 month old GSD? Definitely way too much food! My GSD was a healthy 60 lbs at 5 months on 5 cups a day of canidae. I would recommend a higher quality food, stay away from any corn meal or corn glucose since they are only used as filler. The higher quality is higher priced, but you can feed less so it almost balances out financially. I've also heard great things about the raw diet. It makes a lot of sense so thats another option! I agree... way too much food. I feed orijen & my 6 year old gets 2 cups & my pup gets about 3.5 cups of the large breed puppy.My puppy is a long, lean 85 lbs at 10 months old. You really do want to feel the outline of the ribs. Of course if you are seeing the spine, or ribs are visible bump it up a bit. Have you considered a raw diet? 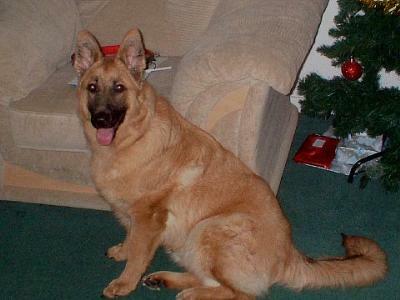 A few gsds I know are thriving on it, and owners say it only costs about 22-30$ per month. If I were in your shoes, I would see a different vet. At 5 months old my pup was 57 lbs, but he is tall and long. Far better to be lean than obese. 9-10 cups is sure a lot per day, heck even 6 is a lot and yes that would get costly. If in doubt about his weight get a second opinion. I keep our dogs "trim". I like to slightly see their last few ribs and be able to feel the backbone. Our dogs are active doing agility, obedience and some sheep herding. Our large (28" at the shoulders) weighs 85lbs. and gets 4 cups of Evo dog food (high protein and nutrient rich) and our small female (23.5") weighs 63lbs. and gets 2 cups a day. By your description "you can faintly see his muscular structure of his ribs" it sounds like he is just right. At 2-3 years old he should begin to "fill out. Being chunky is hard on their hips. Again, if you are still concerned I would get a second opinion.